Integrating grammar and composition, this new edition of the best-selling textbook guides the advanced student through progressively more complex types of writing by organizing the grammar lessons on a functionalist basis around the needs of composition. This innovative approach to teaching Spanish grammar and composition promotes systematic language development and enables students to strengthen their expressive and editing skills in the language in order to write more effectively and confidently. Refined by years of classroom testing and analysis of the problems students encounter, this new edition features the following: a new, colorful design helps students navigate the book more easily and engages visual learning strategies. It offers readings for the major composition exercises have been updated to stress authentic, connected discourse. It offers a fully redesigned companion website (www.books.quia.com) that works with both PCs and Macs and is sold separately. The site offers two-thirds more activities than the previous edition and features an instructor's interface for tracking student progress. It provides a streamlined treatment of points of grammar, including an explanation for more than twelve functions of se with a rule of subject reflexivization. 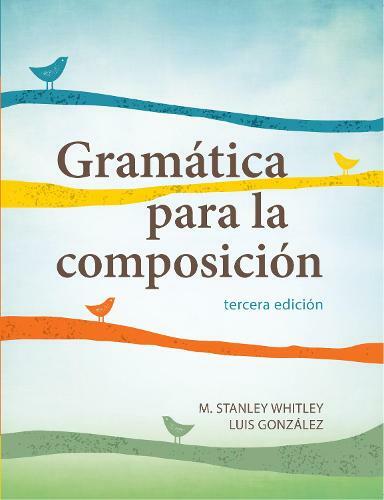 It offers the instructor's manual for Gramatica para la composicion, tercera edicion is available for free on the press's website. It is a wonderful resource for instructors, the manual includes details on updates to the new edition, suggested lesson sequences for different course lengths, and a sectional index of the text. The breadth and depth of each lesson's treatment of the requisite and relevant grammar points is remarkable: the ins and outs of Spanish structure and vocabulary (especially points troublesome to English speakers) are here clarified and exemplified. . . . An invaluable review and reference grammar which students will consult again and again, as they likely make this one textbook that they will not sell back to the bookstore at the end of the term. A comprehensive text for upper-intermediate Spanish composition courses that is complemented by online, student oriented materials . . . A resource that can be used beyond the scope of the class for which it is assigned and can remain an active part of students' libraries long after the class is finished.